Grassroots resistance to proposed new natural gas infrastructure including the Dominion Cove Point Liquefaction plant, the Atlantic Coast, and Mountain Valley natural gas pipeline projects is ramping up as groups and individuals across the country plan a coordinated action called “Hands Across Our Land” for Aug. 18. The group known as Free Nelson is in the process of recruiting county and regional coordinators In communities in Maryland, Pennsylvania, West Virginia, North Carolina, Texas and beyond who are facing the same issues in their communities, as are those in Virginia dealing with the destruction caused by new fossil fuel infrastructure. 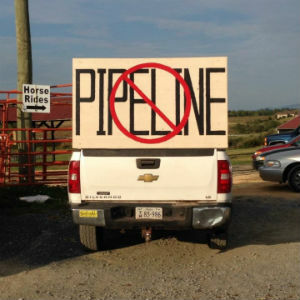 Local actions are being planned in Buckingham County, Franklin County, Loudoun County, Montgomery County, Nelson County, Augusta County, Charlottesville, Front Royal, Richmond, Roanoke, and the George Washington National Forest, in Virginia, in Myersville, and Calvert County, MD, in Monroe and Greenbrier Counties in West Virginia, and the Big Bend area of Texas. “The fossil fuel industry would build their well pads, pipelines, compressor stations and export terminals within feet of homes, destroy thousands of acres of forested land, pollute our water supply and our air, wreak havoc on our local economies, and degrade our national treasures by crossing the Blue Ridge Parkway, the Appalachian Trail, and our pristine national forests. The energy industry would desecrate important Native American historical areas if those who have been good stewards of the land weren’t willing to protect it now. All of this destruction would occur in the name of profit for the few on the backs of thousands of private property owners,” stated Ponton. Hands Across Our Land is designed to express the passionate grassroots support to protect rural communities and their way of life. For a HAOL action outline, interested persons or groups can contact Free Nelson on Facebook or at freenelson3@gmail.com. Hands Across Our Land is being promoted by Beyond Exreme Energy, the Blue Ridge Environmental Defense League, the Chesapeake Climate Action Network, and the Virginia Chapter of the Sierra Club.